Samsung Galaxy Note has always been the ruler of phablets segment in the country since its first launch and pioneered the prominent Smartphone idea its original Galaxy Note concept. With the launch of Galaxy Note 2, the Korean company surely has much to deliver. Xperia ZUltra is a panache device reflecting the larger version of Sony Xperia Z, with metallic frame and glass back. It is IP58 qualified waterproof and dustproof. While the Note 2 looks cheaper of the two with a completely plastic body, the sides look metallic. Though the phablets doesn’t comes with waterproof and dustproof credentials, so the overall built of the phone is undoubtedly less as compared to that of Xperia. Xperia ZUltra has more pixels as compared to the 720P screen of the Galaxy Note 2. It features Full HD Triluminous display with over 2 million pixels while Galaxy Note 2 comes with 720P Super AMOLED screen. Note 2 has a display of 5.5inch while Ultra comes with display of 6.4inches inside its waterproof shell. The gargantuan ZUltra looks hell big as compared to Note 2. Talking about the pixel density, Note is limited to pixel density of 267ppi, whereas Ultra comes with a much higher PPI i.e. 344 pixels per inch. 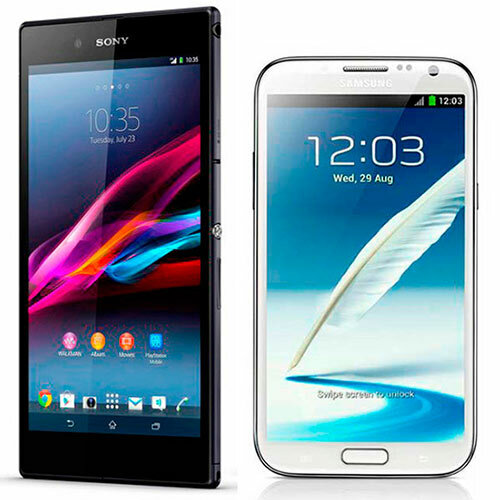 While Xperia Z Ultraadds in height and comes with a thin frame, Galaxy Note 2 looks a bit chunkier with a frame of 9.4mm. ZU is 31% thinner than its rival. Speaking of the weight both the phones, Z Ultra scales up to a massive weight of 212 grams while Galaxy Note 2 weighs 183 grams. 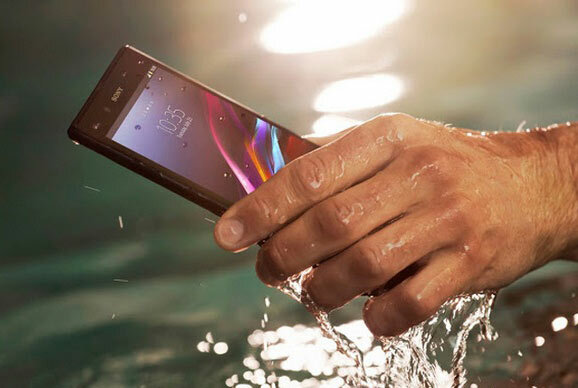 Sony Xperia Z Ultracomes compacted with 2.2GHz Qualcomm Snapdragon 800 CPU with a 2GB of RAM while Galaxy Note 2 features Exynos 4 Quad clocked at 1.6Hz. While Note 2 is about to complete its first year, it’s the new launch of Z Ultra and thus, it comes up with the top processor to give you the finest speed and multi-tasking gaming facility. Z Ultrasports an 8MP camera with 1080p video recording @30fps. It also has a 2MP front facing camera to facilitate video calling. The 16x digital zoom and other image enhancing features, the phone renders smart pictures. Taking the same snapping features, Note 2 comes compacted with 8MP camera with auto focus, LED flash, Face detection and Best Photo feature to give you top class images. It can shoot 1080p video @30fps accompanied with a front facing camera of 1.9MP for video calling. Z Ultra is 4G enabled so you can easily expect the highest browsing performance from the Smartphone. With NFC assistance, one can transfer and share stuff like music and movies and send it to speakers and TV. Other worth noticing connectivity support comprises of Bluetooth 4.0, LTE, Smart Connect, microUSB, DLNA and screen mirroring. Z Ultra has an internal memory of 16GB that can be expanded up to 64GB via microSD card slot. Samsung Galaxy has offers a choice of 16GB, 32GB and 64GB of built in memory that can be expanded up to 64GB. Talking of the connectivity options of the phone, the device supports Wi-Fi, 3G, Wi-Fi Hotspot, Bluetooth 4.0, NFC and LTE. While Galaxy Note 2 is juiced with a battery of 3100mAh offering a standby time of 890hours and a talk time of 16 hours on 3G, Sony Xperia Z Ultra feature a battery of 3050mAh with a promising standby of 80 hours and a 16 hours talk time on 3G connection. Just like its predecessor, Xperia Z Ultraruns on the skinned Android 4.2 Jelly Bean version. It features an additional spec known as Google Now. This promises a strong performance of Sony’s software with impressive app running. The Note 2 runs on Android 4.1 Jelly Bean version with Samsung flagship TouchWiz UI that adds more to the home screen as compared to the standard screen. This gives the native apps of Samsung centre position such as S-Planner and S-Suggest. While the original Galaxy Note brought back the fashion of Stylus, Z Ultra takes you a step ahead and gives you a pencil or pen to write notes on the display. As quoted by Sony, you can use any pencil, pen with a tip diameter of more than 1mm. Note 2 offers the S Pen but doesn’t offers Stylus, pens or pencils as Z Ultra. With IP58 rating, it can be said, that Z Ultra can dive under water for 30 minutes at a depth of 1.5mteres and work perfectly well. On the contrary, Galaxy Note 2 doesn’t have any such capabilities to flaunt, so it needs to be kept away from water and water bodies. Having discussed both the platforms on common grounds, it is quite evident that Xperia Z Ultra is a finer device with much talked features such as BRAVIA inspired display and stylish Z looks. Right from the quad core CPU to the 8MP camera, the phone has all the capabilities and potential to stand against Note 2 and even beat it with features like waterproof body and fast processor. Galaxy Note 2 will soon turn a year old and thus require updating and enhancements. With galaxy Note 3 to soon launch in the latter part of the year, buzz is around and we’ll get to see a much better version of the phablets. Though speaking of the price where Z Ultra is available for INR 42,890, Note 2 has been tagged at 28940 INR. Thus, the fight still goes on. With enhanced features and amazing graphics, Xperia Z Ultra is surely the show stealer. And, receives accolades for its bigger size and well-developed design. Stay tuned to find out more on the combat of both the devices. But right now Z Ultra springs up to be the real winner.